← That May Have Been The Towel You Heard Hitting The Floor. I love history. I love the obscure. I love the United States of America. Imagine my delight when I found a book that meets all three of those categories, and does so in a non-fiction narrative that will choke you up about every three pages. 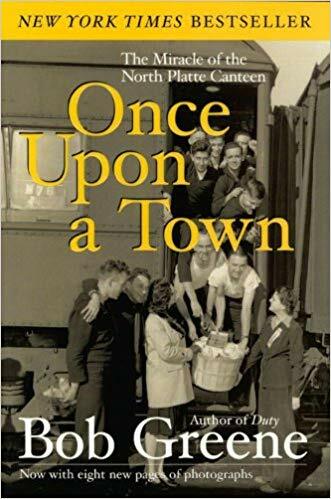 Once Upon a Town: The Miracle of the North Platte Canteen is such a book. A beautiful salute to an American town. If you are a regular, you know that my book reviews are nonstandard. It comes down to this: it’s a really great story. It’s a true story. It’s full of the stuff that makes me proud to be an American. It has a wonderful style to the writing, and Bob Greene’s mom should be very proud of him. I read about it somewhere else, can’t remember where, and read it in just a few days. Okay, if you insist: it’s the story of a small town in Nebraska that met every troop-train that stopped there for almost all of WWII. They started in December of 1941 and continued on through the war. They met every train. They charged nothing. They did it all with volunteers. They changed the lives of thousands of soldiers and sailors. That enough? Good. Go buy a copy and get to work. It’s magnificent. This entry was posted in book review, Love, military, popular culture, Uncategorized, veterans, volunteers and tagged amazing story, bob greene, bygone era, cakes, canteen, coast guard, commotion in the pews, cute girls, farmers, first-hand accounts, giving, hardship, honor, joseph courtemanche, love, magnificent, Marines, military, nebraska, north platte, ranchers, sacrifice, sailors, soldiers, trains, troop train, volunteers, wwii, young men. Bookmark the permalink.